There’s no better feeling than the moment you sign your closing documents and receive the key to your own home. Except maybe that moment you make your LAST mortgage payment! 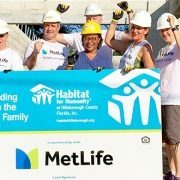 Many Habitat Hillsborough homeowners have experienced the joy of paying off their mortgages and have reflected on how those affordable mortgages have impacted their lives. Only a few months ago, our Habitat staff gathered with four homeowners to have a mortgage burning party! With happy tears and broad smiles, we celebrated the triumph of successfully completing decades of monthly payments that were the key to strengthening their families and putting them on a brighter path. Decades ago, Mary Ann Rodriguez found herself at the end of a long, painful road that led her to a women’s shelter for battered women – and a new direction. With the help of the shelter workers, she gathered her inner strength and resolved to chart a new course for herself and her young daughter. 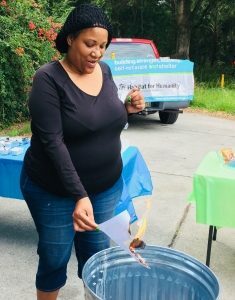 The shelter workers helped her find a safe rental apartment she could afford on the modest income she earned working for Hillsborough County Road Maintenance. She shared the rental with another single mom. But Mary Ann yearned to be more independent. 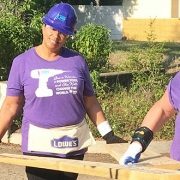 So when she heard about Habitat for Humanity and the chance to own her own home and control her own destiny, she set her sights on the program. After completing Habitat’s sweat equity and homeowner education requirements, Mary Ann was thrilled when the day arrived to obtain her mortgage and receive the key to a home she could afford — one that would actually help ease her financial burdens and provide a solid foundation for her family. As she stepped through her doorway, she knew she was stepping into a life of independence and an environment where she could nurture her child and finally feel at peace. These days, Mary Ann is retired and enjoys the freedom and extra money on hand from not having any more mortgage payments. Her daughter has grown into a beautiful young woman with a husband and two daughters of her own. Mary Ann strives to stay involved in the community. She loves having her grandbabies visit. She stays healthy by riding her bike and walking her dog. Life is good. Her course correction decades ago led her down the path to the life she had envisioned for herself. 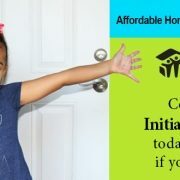 Taking Habitat up on the opportunity to purchase an affordable home made all the difference getting there.